Home » Job Search » Where to Find Job Advertisements, Where Are All the Jobs? Where to Find Job Advertisements, Where Are All the Jobs? We all know about job boards online, recruitment agencies and government but how about the rest of the job sources? Less and less companies are advertising their positions in newspapers today but spending your time checking newspaper adverts is not a waste of time yet. Advertising a vacancy in a paper doesn’t only advertise the job but the company itself too. That’s the reason we might still see classified ads in the papers as long as newspapers are alive! Many councils are organising local job fairs to help job seekers find a reasonable employer for them. The companies don’t do it out of the goodness of their hearts though. Job fairs are also helping companies to get their brand across to locals and find their employees at a very lower rates then any other methods of advertising. Not only councils but MPs and some other organisations are also arranging those job fairs, so it’s worthwhile checking to see what’s available in your area. Google is the first place most of us go to when we want the answer to anything so why not use this giant search engine to find a job. 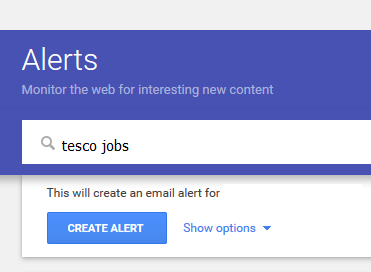 Go to Google Alert and start using keywords such as “Tesco jobs” “IT jobs” “jobs in London” etc. You will receive an email as soon as something new happens about your subject. Career coaches can help you find a job from writing your CV, to which positions are appropriate for you to apply for. This option is usually the most costly to the job hunter as they have to pay for the career coach. However if you select a professional and knowledgable firm then the benefit may outweigh the costs, particularly if you are going for a big career change, and paying out may get you a better role. If you left your previous jobs by working out your full notice and in a friendly way, then your ex-bosses and colleagues can be a good source of new job information and references in your new job hunt. If you contact them about your job seeking then they may have inside information about opportunities within the company you worked for before or somewhere else. A letter from your former boss to potential ones is more effective then the most powerful CVs. Social networking sites can be really helpful if you use them wisely. They probably won’t be a place to search for a new job but they may be an excellent source of inspiration. Many local and national companies are posting their latest vacancies on social networks so following them is the best idea. You should also ensure your social profiles are all nice, tidy and professional looking if you are in a job hunt. This one is not a source which is likely to lead to your new job, but learning about the impression you left on interviewers may give you a chance to update yourself and be prepared for the upcoming interviews.